I really hate flying. (On a commercial airline, I should say. If I could fly like Superman or Warren Buffett, I'd have no problem with it.) I'm not fearful; I detest the lines, the delays, the boarding process, and the cramped, noisy airplane. I have creative ideas for fixing all of these (oh, I could go on about how to fix the TSA line...), but I recently realized there's an easy solution for one of the worst parts of air travel: the Crazy Weirdo Factor. This refers to the necessity of sharing an armrest with someone you don't know, a stranger—in other words, a certified Grade-A crazy weirdo. The sad fact is, if you fly solo, there's just about a 100% chance of sitting next to a crazy weirdo. Rare is the airplane that isn't booked to capacity, or even oversold. But, if you travel in a group, there's an easy way to ensure that nobody in your group has a crazy weirdo next to them. 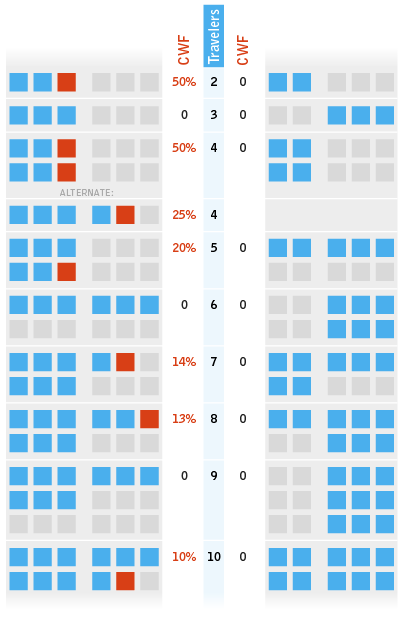 All the airlines have to do is switch from a 3/3 seating plan (six seats with an aisle right down the middle) to a vastly superior 2/3 split. The results are dramatic. Traveling in a pair? Instead of half of you sitting next to a crazy weirdo, nobody has to! And the benefits don't stop there. With a 2/3 seating plan, you never have a crazy weirdo next to you. Unless you fly alone; but solo fliers are always out of luck, unless they can figure out how to "deadhead" like Leo DiCaprio in Catch Me If You Can. It's amazing! With this one adjustment to the seating plan, airlines could not just reduce the Crazy Weirdo Factor for groups of all sizes, they could eliminate it altogether. Gone! A miracle—peace in our lifetime! By the way, for everyone who thought the previous post would rot on the homepage forever... Ha! It only rotted there for about four years! This is the most recent thing I posted here. It may be so outdated that it’s completely irrelevant.